An actuation device for a circuit breaker comprising a winding or solenoid 2, a plunger or lever 1 and a self-check arrangement wherein the movement of the plunger further controls the opening and closing of an electrical switch other than that providing circuit protection. During a test the plunger moves in the direction of trip 8 without tripping the circuit breaker mechanism 7 in order to establish the location and any movement of the plunger the functionality of the winding and the tripping force. The health check arrangement may comprise a spring contact 6, one end of which is movable between a pair of contact plates 4, 5 according to the movement of the plunger or alternatively light emitter and detector pairs (23-26, Fig. 3) arranged such that the plunger position controls the passage of light between them. The device may further comprise a timing device and a failure warning means. 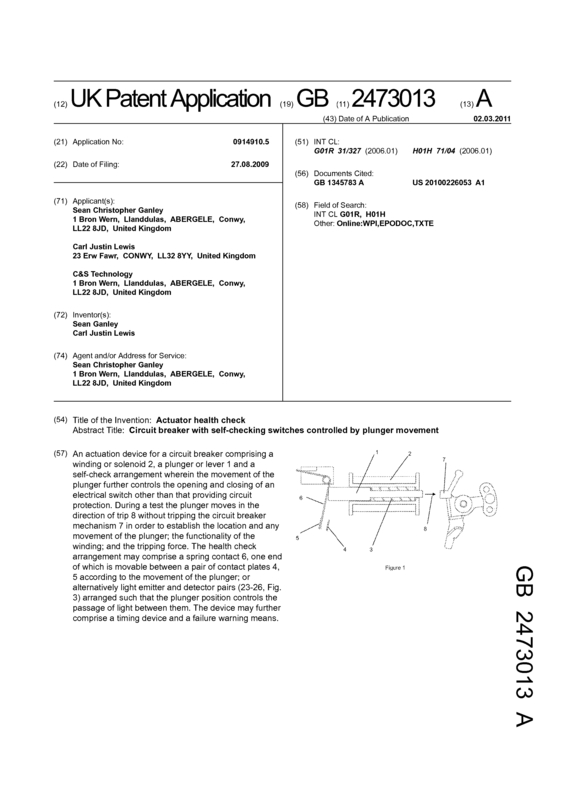 Page created at 2019-04-22 15:01:12, Patent Auction Time.